This topographical map of the UK includes the Orkney Islands, the Shetland Islands and the Faroe Islands. View this map to gain a quick understanding of the high and low areas of Great Britain and the surrounding waters. To print this UK topo map, click on the map. After map loads, press Ctrl+P. The United Kingdom features a long, rugged coastline, heavily indented with many inlets, bays, and river mouths. Headlands and cliffs may be found along some parts of the coast, especially in Scotland where wide firths and deep, narrow lochs abound. The topography of England features hilly regions in the north, west, and southwest as well as rolling downs and low coastal plains in the east and southeast. 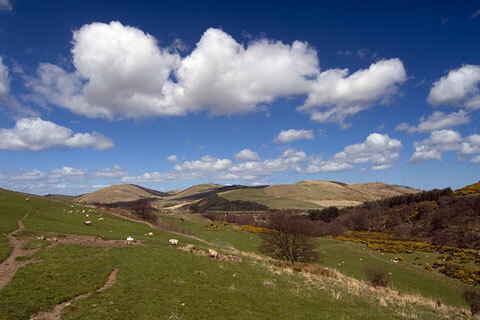 The Cheviot Hills run from east to west on the Scottish border in the north. The Pennines run north and south from near Scotland to central England's Derbyshire region. Fertile agricultural lands, moors, and plains comprise much of the remaining countryside. The east and west Midlands region, with its rolling hills and dales, lies to the south of the Pennine Range. England's highest point is Scafell Pike, in the northwest Lake District, which rises to 3,210 feet above sea level. The Severn and Thames rivers of southern England are the longest, at 210 miles and 200 miles, respectively. 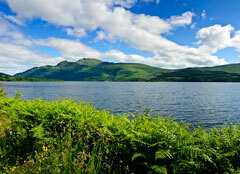 Scotland features three topographical areas. The Northern Highlands occupy the northern half of Scotland and include Ben Nevis, the highest point in the UK; the Central Lowlands average about 500 feet in elevation and contain the Tay, Clyde, and Forth river valleys as well as Scotland's largest lake, Loch Lomond; the Southern Uplands feature the Scottish moor lands with their many rivers and dells. Wales is a hilly, pastoral region occupied largely by the Cambrian Mountains. The highest point in Wales is Mount Snowdon, which rises to 3,563 feet above sea level. There are small lowlands in the north and narrow plains along the south and west coasts. Most of Northern Ireland's topography is low-lying hills and plateaus, usually no more than 500 feet high, although the Mourne Mountains of the southeast rise to 2,796 feet at Slieve Donard. The largest lake in the UK is Lough Neagh, which is located in central Northern Ireland.